We install electrical systems into new homes and buildings. Are you in the planning phases of your home or building construction project? The electrical systems in your home are an integral part of how your home operates. There are literally miles of hidden wiring in the average home and it all serves an important purpose in your household. Trusting your electrical projects and electrical installations to anyone less than a professional can be disastrous. ACTS Construction Group LLC is a full service general contractor serving Seattle and the surrounding area. We specialize in the installations of electrical systems and wiring into new homes and new construction projects throughout Seattle. From installing the wiring and electrical into your new detached shop to wiring and doing the electrical work for an entire sub-division our team of qualified electricians can complete your electrical installations safely and cleanly. 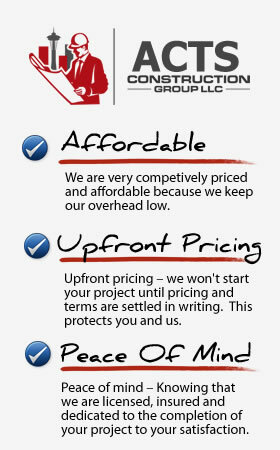 Why Choose ACTS Construction Group LLC For Your Electrical Project in Seattle? When you choose to work the ACTS Construction Group LLC you are partnering with a team of construction professionals who have many years of experience installing wiring and electrical systems into new construction projects. You can be sure that your home will have an electrical system that was safely and cleanly installed by a team of electrical professionals. If you’d like to receive an estimate for the electrical in your upcoming construction project please give us a call 206-503-6200 or fill out our contact form and someone will be getting right back to you.